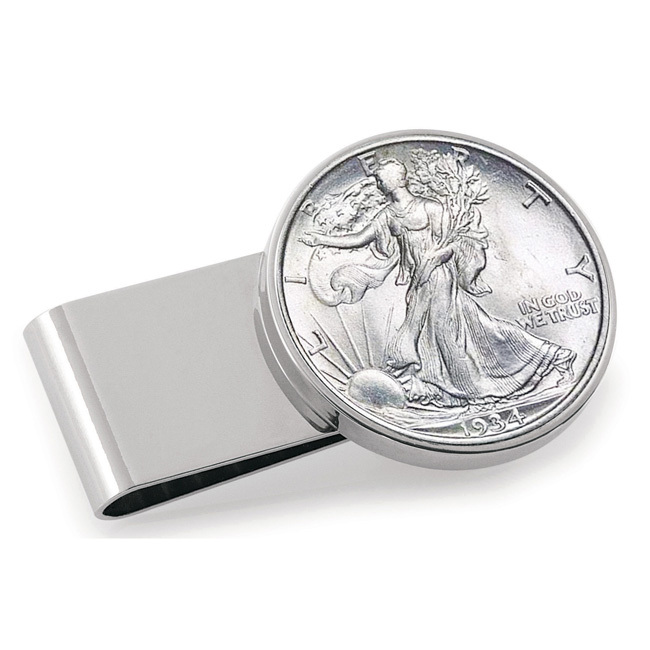 Men who like to accessorize their look with something unique, as well as coin collectors and historians, will love this Walking Liberty half dollar money clip! It's made of silver-plated stainless steel, with a genuine Walking Liberty Half Dollar inset, struck in .900 fine silver. The French-fold money clip style grips up to 25 folded bills, and lays flat in the pocket. Add custom engraving above the coin for free! 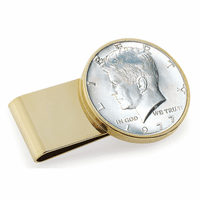 This money clip comes with a Certificate of Authenticity, and is packaged in a gift box. Does the coin snap in or is it permanently in? The coin is permanently set into it. I need the middle initial larger. 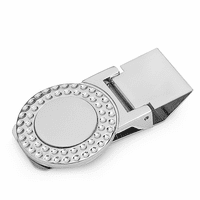 Just let us know in the comments section of our checkout page that you would like the center initial larger. Is it possible to obtain one with a coin from a specific year? It is a milestone birthday and I am looking for one with a coin from 1940. We're so sorry but we don't have specific year's available by the order. Right now, the only year we have is 1943. Do you engrave initials? This is a birthday gift for my son,he is a coin collector and I thought this would be nice gift for him. Yes, we do. Just check the Personalize It box above the Add to Cart button and you'll be able to enter engraving instructions. The coin fell out of it moments after my father opened it for Christmas. Not worth the money it cost. I will be returning it. 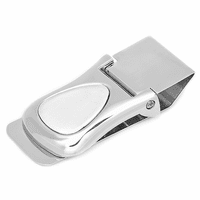 Merchant Response:We are so sorry about this, you received a defective money clip. This is not something that normally happens, the coins are normally bonded in very well. We'd be happy to send you a new one free of charge, the same style or a different style. Please let us know if this will work. Otherwise, we'd be happy to issue a full refund for you. This item was exactly was exactly what I wanted for my husbands Father's Day gift. Shipping was really fast and arrived before Father's Day, considering how late I ordered it. Very pleased overall. ProsFast shipping, fit description perfectly.